When you want high-end ergonomic features in a chair at a fraction of the price of most ergonomic desk chairs, the J3 Ergonomic Chair by UPLIFT Desk is here for you. With this chair, you'll get it all with adjustable seat height, seat depth, back height and tilt, armrests, and headrest, allowing you to personalize your sitting experience with just a few quick modifications. Is back pain keeping you from coming up with a good idea or completing a task? Well, that won't happen with the J3 thanks to the chair's reliable lumbar support that cradles your back where you need it. Factor in a breathable mesh back, and you'll be sitting much more comfortably than you're used to, at a price that fits your budget. This mesh chair's leather seat is soft yet durable, giving you a more comfortable home base. The J3 comes with an adjustable, removable headrest that is optional if you'd prefer to work without it. Outfit your office for ideal ergonomics, and don't forget your office chair - where you'll be for much of the workday. Enjoy better seating with the J3 Ergonomic Chair by UPLIFT Desk. Get $30 off the J3 when you pair it with an UPLIFT Desk. What sets the J3 apart from other ergonomic chairs, including UPLIFT Desk's chairs? If you've ever wanted more comfortable seating, the J3 Ergonomic Chair by UPLIFT Desk is here to deliver! It boasts a large collection of ergonomic features, such as adjustable lumbar support and an articulating headrest, all at a much lower cost than other ergonomic office chairs. Better seating is here, and it starts with the J3. See what features you can expect on our chair comparison chart. The J3 Ergonomic Chair was designed with the utmost in ergonomics in mind. Every feature included on the chair is meant to amplify your comfort levels, from the 5-star base to the height-adjustable armrests and articulating headrest. Participate in a better way to sit with the J3! The J3 comes with a leather seat cushion, which we have found is ideal for users who sit for a majority of the day. If you want an all-mesh chair, we recommend the Pursuit Ergonomic Chair! We love the Pursuit Chair by UPLIFT Desk due to its unique breathable mesh back and seat, very adjustable armrests, and supportive headrest! Compared to the Pursuit, the J3 comes with a heavier duty seat cushion that's contoured and covered in luxurious leather, so you can sit for longer than you could in a mesh chair. Yes, the J3's headrest is removable and adjustable! The headrest can even be removed after it has been attached if you don't want to sit in a seat with a headrest. The J3 Ergonomic Chair's seat cushion is mildly contoured and upholstered in leather, which makes this a suitable chair for all-day use. The J3 was designed to support weights up to 250 pounds, so it works for a large majority of the population. If you have questions, feel free to call us and we can help you determine if this chair is the right one for you. A mesh chair back allows you get more airflow to your back, so you can work comfortably in warm and humid environments. Great chair, but not perfect - even considering the price. 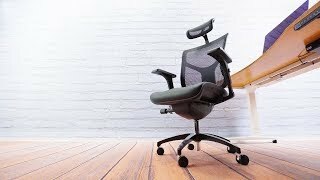 First I want to say that the review on this site by Jeff Jones is very good and helped me decide to buy the chair. I am going to amplify and interpret some of his comments. I am very happy with it, but it is not perfect. Depending on what you value will determine if this is a good chair for you. Buying an office chair is tough. I was limited by popular choices to test in person and on-line reviews are not informative enough. So I wrote a long review with details in hopes this review will help others. This chair is a great value! I love it. The price is low for such a quality chair. Some features are very good, regardless of price. Some feature are very good considering the price, and some are not so great. - Price/value (as mentioned): it's in the range of low to mid-range chairs you'd find at big-box office supply stores and is a much better chair than those - both is terms of comfort and build quality. - Build quality: it feels substantial and doesn't seem cheap. The base is metal and is well made. The seat is pretty comfortable and rightly contoured (not too much, not too little). Armrests are really solid and heavy and don't rattle more than seems needed to allow them to move up and down. I have wedged in some spacers and they are now very solid. I hate a rattly armrest. The chair is above average for this price range for sure. -Looks: It's a good looking chair. - Mesh back: The mesh back is great! It is very cool and comfortable. I like the lumbar curve. It is an aggressive curve and has reduced my back ache to zero from my old chair which had a slight lumbar curve. It forces good posture in a comfortable way. I'm sitting much straighter. The chair is worth the money for this alone. - Seat - the seat covering is bonded leather. For this price range, that's probably about right. I'd rather it were a high-quality vinyl as that would wear better/longer. If seat lasts, I'm sure I'll have to recover the seat in intermediate future as bonded leather usually doesn't last long. The seat is comforatable in the middle of the cushion. Near the sides, the cushion is thin and the plastic frame is more uncomfortable. For those with wider backsides, be aware. I will probably get a secondary cushion to sit on top. - Armrest pads: They are dense rubbery/plastic material. They are comfortable. I'd say they don't feel "natural" but it's OK and certainly better than hard pads I've seen on other chairs. Leather covered would be wonderful, but probably not going to happen at this price. I'd prefer the rubber to a bonded leather that will crack soon. One negative is that, - while the armrest pads are removable and could be replaced - the spacing of the mounting holes is non-standard. Standard seems to be 4 inches or 5.5 inches between mounting holes. The pads on this chair are at ~ 6.125 inches. I can't find pads yet to match. - Cylinder: The gas cyclinder used on this chair is standard type. It is a class IV cylinder when the best are class V (user weight rating). Class III seem to be the cheap ones, so class IV is appropriate for the price of this chair I think. I tried to find a class V to use in place of the one provided, but the cylinder used is a very odd size and I could only find class IV available. It seems to work fine and I expect it to last a long time, but class V would probably last longer and it is pain to replace press-fit cylinders! - Seat mechanism: Seems fine, has a lot of adjustments that you will need to use only once. Other than tension (see below) it is good. - Headrest adjustment: By far the biggest potential negative is the limited adjustability of the headrest relative to the seat back. It is not enough. The headrest (neckrest) is comfortable and one of the reasons I picked this chair. I am fortunate that the limited range of sizing works for me. I'm 5 ft. 9 in. tall, but with a slightly longer torso. So this chair would problaby work for people in the 5-7 to 5-11 height range if you keep the headrest. The back has height adjustments in five increments. For me, with the headrest all the way up, the lowest setting has the lumbar support too low, and the headrest in the middle of my shoulders. The second setting has the lumbar is a good spot, but the headrest is too low. The third setting puts the headrest in a comfortable spot and the lumbar curve is good for me (I like it a little high/aggressive). The fourth and fifth settings are for someone taller but I wonder if there is enough distance between curve at neckrest. Note each setting seems to move the back about a half an inch. If the headrest had more adjustment, this chair would fit everyone. As it is, it will fit those who like a higher arch support and are average range of height. It will fit those who like a lower support, if they are shorter or are willing to remove the headrest. -Tilt tension: The ability to adjust the tilt tension was something I really wanted. My old chair had a lot of tension and I could use it like a rocking chair without falling backwards. This chair does have adjustable tension, but it is not super-strong at the highest setting, but is probably OK for most people. User experience will vary with weight here. Judge according to your use. What I've taken to doing is leaving the back locked, but setting it at first reclined position when I want a different angle from my normal working angle (straight up). - Arm rest height: This is a personal taste issue. I like my armrests very high so I can lean left or right easily. The armrests here are too short for that. They are about the height (at tallest setting) to just graze the elbow with shoulders lowered so I have to tilt to the side to lean on them. This may be ergonomically correct, but I'd prefer it higher for more support, misses by about an inch for me. In giving this chair 5 stars I factored in comfort, design, looks, quality, and price. I considered 4 stars due to a couple design issues but for the price it's a 5 star chair due to the other factors (comfort, looks, quality, price) being very strong. I also will mention that I have the Ergohuman with headrest and the J3 has shortcomings in a direct comparison but the Ergohuman is $600. Pros: Fast delivery, easy assembly, leather seat, highly adjustable, good looking, no competition in it's price range, and once adjusted to my body it's very comfortable and keeps me in a healthy ergonomic position. Cons: First I'll mention I'm 6'1" and 195 lbs so I consider myself average tall - nothing out the ordinary. The headrest is useless to me - doesn't even come close so it's been removed (and I did adjust it correctly to the highest level). So that's design flaw #1. A related flaw is the back height adjustability. It's related because in order to get the headrest remotely close to the proper spot I would have to raise the back height to it's highest level which puts the lumber support arch way up to the middle of my back where I don't want it. In fact for this chair to hold me right I have the back in it's lowest position. So to be specific the flaw in this case (flaw #2) is that the adjustable back serves no purpose for anyone my height or lower which will be most people. Adjustability adds production costs and they could have removed the useless adjustability of the back and I suppose priced the chair even lower. Or keep the adjustability and put the lumbar arch a few inches lower than it is. Summary: In spite of the two flaws I pointed out the chair works great for me and I love it. It would have been nice to have the headrest but I didn't expect it in this price range. I think it will serve most people very well but I do wonder how a much smaller person will fare with the lumbar arch. If it's perfect for me (6'1") in it's lowest position then will it work well for someone 5'4"? Maybe. Maybe I have a weird back or maybe everyone's lumbar area is in approximately the same spot. Hopefully this question will be answered by future reviewers.